Vitiligo patches (White Patches) are the most difficult variety of vitiligo to manage The primary reason behind failure of treatment in these areas is the absence of viable melanocytes in the skin and the absence of hair follicles ,the second reason behind failure to achieve repigmentation in these areas is that there is disease activity. 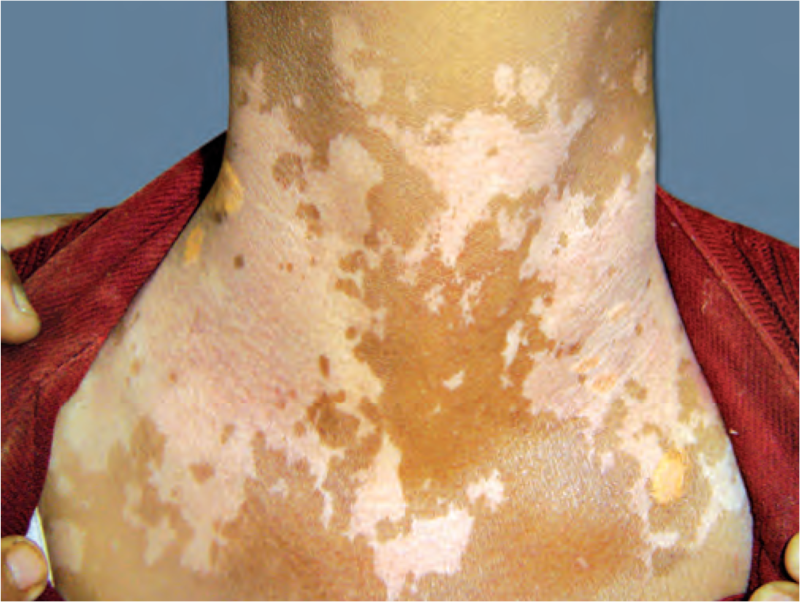 The primary reason behind the failure is the absence of viable melanocytes in the skin and the absence of hair follicles as is now evident that the repigmentation in generalized vitiligo following medical therapies is perifollicular (If the hair on the depigmented patches are still pigmented) or it is marginal repigmentation i.e. 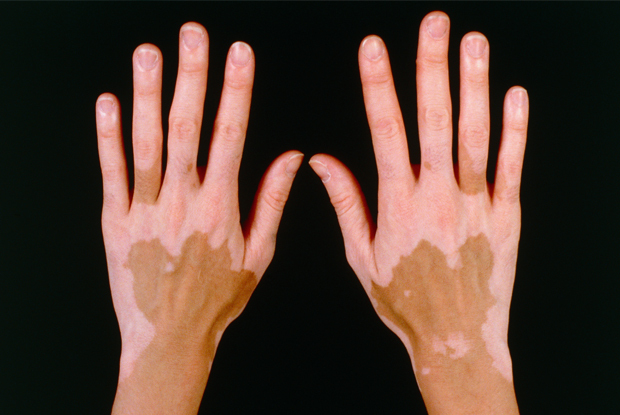 melanin production from the viable active melanocytes present in the margin of the vitiligo patch. Coming to management of acral vitiligo as has been discussed endless medical treatments are not only futile but dangerous if we actually consider the long durations for which some patients of acral vitiligoare subjected to systemic steroids, immunosuppressive, UV radiations when it is quite evident that these areas are unlikely to repigment unless the melanocytes are replaced. It is important for the treating dermatologist to understand and acknowledge the fact that beyond a certain limit medical treatment will not work and its best to replace the missing cell i.e.the melanocytes with a surgical procedure which he or she is apt at. Tattooing or micro pigmentation is a process in which artificial pigments are introduced into the mid dermis level of the vitiligo lesion. In most cases the final color matching is very poor and barring few areas like the angles of the mouth, this procedure should be avoided in all patients. The tattooedparticle imparts a bluish tinge in the vitiligo skin and it is difficult to correct with other surgical procedures. Ultra thin split thickness grafting can be used for large areas however it is a highly skilled based procedure not all surgeons can harvest ultrathin grafts and the grafts may give a stuck on appearance, hyper pigmentation and hypertrophy, perigraft halo and milia formation are other issues commonly encountered. Also the biggest disadvantage is that large sheets of donor area skin are required which in many cases may produce scarring at the donor site. Preoperative laboratory studies include complete haemogram including platelet counts, bleeding and clotting time (or prothrombin and activated partial thromboplastin time), Thyroid profile, LFT, KFT, serum electrolytes, Chest X ray PA view, ECG in adults. Screening for antibodies for hepatitis B, C and HIV is recommended. Small areas can be managed under topical and or local anesthesia in an OT as a day care procedure. The lateral aspect of the gluteal region is selected as the donor area. Care should be taken to ensure that the Donor area had no vitiligo patches. The size of the split-thickness donor skin takenis one-tenth of The recipient area while dealing with large confluent patches. In cases having multiple scattered small patches, larger donor skin is taken – approximately one-fifth of the recipient area. Under aseptic precautions, a very superficial sample is harvested using a shaving blade held in straight Kocher’s forceps. The donor area is dressed with liquid paraffin dressing tulle (Fairlee™) and sterile gauze pad. The cell separation was done under aseptic precautions in a laminar flow bench kept in the operation theatre. The skin sample harvested is transferred to a Petri dish containing 5 ml of the 0.2% w/v trypsin solution, epidermal side facing upwards, and incubated for 45 min at 37°C. After 45 min, the action of trypsin is neutralized with trypsin inhibitor (Life Technologies, USA).The epidermis is separated from the dermis and transferred (epidermis) to a test tube containing 2 ml of Dulbecco’s modified Eagle medium: Nutrient Mixture F-12 (DMEMF/12) medium (Life Technologies) and vortex mixed for 15 s.
The epidermis is further broken into smaller pieces in a Petri dish and washed with the DMEM F/12 medium and finally transferred to a test tube containing the DMEM F/12 medium and centrifuged for 6 min. The supernatant was discarded and the pellet was suspended in a 1-ml insulin syringe The final volume prepared varied from 0.2 to 0.5 ml depending on the size of the area to be treated. The recipient site is abraded with a dermabrader fitted with a diamond fraise wheel (Delasco™) While operating close to the eyelid margins, an Erbium: YAG laser is usedwith a fluence of 1000 mJ, 1–2 passes. The endpoint of ablation is pinpoint bleeding. Haemostasis is achieved and the ablated area is covered with saline-soaked gauze pieces. The cell suspension is spread evenly on the dermabraded area and covered with collagen dressing (Collomedica Laboratories) to hold the cells applied This is covered with liquid paraffin and gauze pieces. Patients are instructed to lie still in the same position for at least 1 h to ensure cell fixation and then shifted to a room and further instructed to avoid excessive movements of the treated area for at least 6 h.
All patients are instructed to take complete rest and avoid all vigorous physical activities. Patients are Prescribed oral antibacterial agents for 5 days and nonsteroidal anti-inflammatory drugs (NSAIDs) for 3 days. The dressings are removed after 1 week in most cases. Patients are asked to follow up at weeks 1 and 3, and then at 3-month intervals. Patients were instructed not to scrub the area and postprocedureno medication was prescribed. Patients were permitted to use make-up on the treated area 10 daysafter the removal of dressings. Larger area ( full eyelid) collagen>> paraffin>> guaze>> pad>> close eye for 7 daysHow I do it Finger tips!!! How I do it Lips!!! The advent of vitilgo surgery has definitely changed the treatment outcomes of vitiligo esp. in the acral and segmental variety; and in vitiligo surgery it is the autologous non cultured cell suspension technique which has totally revolutionized the surgical options and has taken the patient and doctor satisfaction to the highest level.However it’s important that before we subject any patient to any vitiligo surgery we have a detailed discussion regarding the advantages, disadvantages, limitations of the treatmentEach patient should be counseled about the risk of failure, riskof incomplete repigmentaion, colour, texture mismatch, and most of all the risk of recurrence. 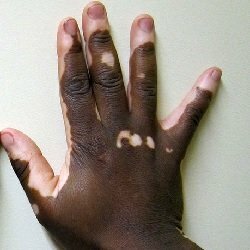 Vitiligo is an autoimmune disease and it can have its phases of stability and activity, surgical procedures should be taken up only in cases which are at least one year stable and in most patients medical treatment may be need to continued even post surgery to keep the autoimmune process in check.Every patient of vitiligo is an individual and the treatment surgical or medical should be customized or tailor made according to the type, extent, stability of the disease, equal consideration need to be given to the medical condition of the person i.e. age, family history, co morbidities e.g. diabetes, hypertension etc. we should keep a watch out for the potential side effects of the medical treatment i.e. medications, lasers, lights.Hence a holistic approach keeping all these Factors in mind will provide a ray of hope to the cases of vitiligo.